Hearing on editor in chief of the anti-immigrant publication MV-lehti, Ilja Janitskin at District Court of Helsinki on Tuesday. Photo – Lehtikuva. The Helsinki District Court on Tuesday issued a warrant for arrest of the anti-immigrant publication MV-lehti editor in chief, Ilja Janitskin, who remained absent during the legal procedure. Janitskin is suspected of ethnic agitation, aggravated defamation, money collection offences, gambling crimes, menace, and crimes against confidentiality and intellectual property. Janitskin’s incarceration will be handled in court on Friday. Last month, the Helsinki District Court dismissed the police request to suspend the MV-lehti and the Uber Uutiset publication distribution network. 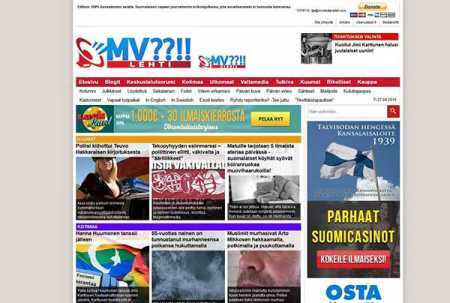 The court decision and reasons should have remained a secret, but the MV-lehti announced the decision. MV published a series of secret documents in which the police based their request on the fact that the Janitskin-run sites could have published messages committing several crimes. According to District Prosecutor Heikki Wendorf, Janitskin has not been willing to come to Finland for his hearing. “It is essential that the suspect be interviewed for the case in order to complete the preliminary investigation,” Wendorf told the news agency STT.